Chiropractic and Headaches: Are There Normal Headaches? One of the most bizarre things I’ve heard recently is a patient told me they get “normal” headaches. Since when have headaches been “normal”? They are common but not normal. Thousands of people suffer unnecessarily from headaches on a regular basis. The World Health Organization (WHO) has estimated that around 47% of the world has had at least one headache in the last year. It is estimated that 2-3 million people chronically suffer with migraine headaches, that can be debilitating and life altering, not just for them but also for the family and friends that love them. The World Health Organization defines a headache as the most common disorder affecting the nervous system. It also states that it is the most under-estimated and under-recognized disorder throughout the world. Many people are taking a wide variety of medications with dangerous side effects to be able to function normally on a regular basis. A headache is a sign that something is affecting our nervous system. Like many symptoms, it is our body’s way of letting us know that something is wrong. 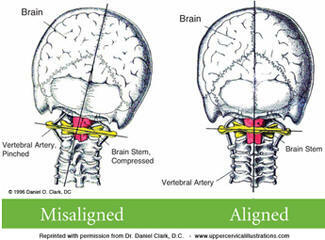 Most of the time these issues can arise from a subluxation in the upper neck. In the picture to the left you see the skull and the cervical spine. The first two vertebrae in your neck lie in very close proximity to your brainstem making it’s proper alignment very crucial. Also all blood vessels, nerves, and cerebrospinal fluid must pass through this first bone in your upper cervical spine. It is very common for headache sufferers to also have recurring sinus congestion, due to poor drainage, which may lead to sinus headaches. As you can see from the picture, a subluxation in the upper cervical spine can interfere with the delicate balance and flow of the many fluids and nerves that must pass through this tiny pathway. If these are interfered it with it can cause a lot of stress to the nervous system as a whole, but can also interfere with proper blood supply to the brain and meninges, this is the tissue that holds your brain in place and keeps it from knocking against your skull. The meninges have a lot of blood vessels running through it and are very sensitive to pain. The meninges extend into the spinal canal and protect the spinal cord. Any twisting or torsion of the meninges may show up as a headache. Headaches are a signal from the body for help. Many times we try to cover up that signal by taking a pill or prescription to cover that up, but that doesn’t address the CAUSE of the headache. It’s not until you address the cause of the headaches or migraines that you will find relief for good! At Vitality Family Chiropractic in Westlake Village, CA we use state of the art, NASA-certified technology to get to the true underlying cause behind your headaches. By using this technology we can let you know what the problem is and how long it will take using objective and accurate testing that’s pain-free and radiation free.